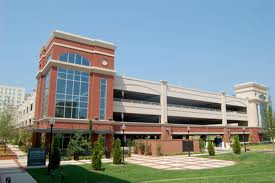 Featuring 731 spaces, this pre-cast parking deck supports the USC Upstate School of Business and various patrons of downtown Spartanburg. The facade is pre-cast, brick infill at the lower level with full height brick infill at the corners of the building. The encapsulated stair towers on each end include storefront glass and elevators.